We’re at the tail end of the peanut season with maybe a few weeks left. I got mine at the farmers market, but I’ve also seen in them in Asian groceries. The nice thing about raw peanuts is if you see them but don’t have time to cook them you can freeze them for later. I’ve always associated boiled peanuts with the southern U.S., but they’re a street food served all over the world–Africa, Asia, South America. 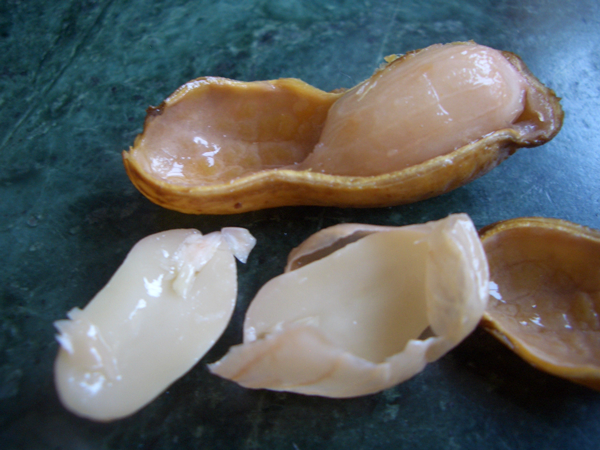 The basic formula appears to be the same–peanuts boiled for hours in salted water until they’re soft and creamy and–you guessed it–very salty. They’re not the prettiest thing from the outside–a little like a peanut you might find at the bottom of a dumpster–greyish brown and wet. Oh, but stay with me. When I put a bowl of these in front of my friend who’d never had them before, she gave me a polite smile but I could tell they didn’t exactly ring the dinner bell. That said, there weren’t many left at the end of our visit. She even took a sack of raw nuts with her to boil at home. For those who’ve never had them, it’s hard to describe the taste. Overall I find them kind of vegetal almost like a buttery artichoke heart. I was curious to see what they would taste like with a little flavoring. In Asia they’re often boiled with star anise, but I tried 5 spice powder and that was tasty. Then I tried smoked paprika and that was good too. The thing you should keep in mind about boiled peanuts is once they’re boiled you need to consume them within a few days or they truly will belong at the bottom of a dumpster. If you need to freeze your raw peanuts for later: wash the nuts in the shell, blanch for 10 minutes in boiling water, drain, cool and store in freezer bags or containers. 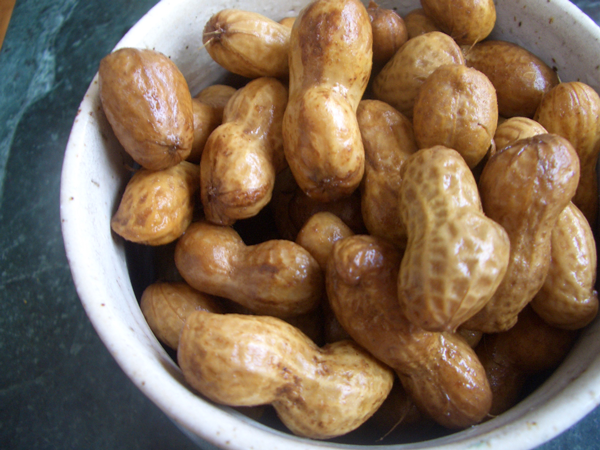 For every 1 pound peanuts, 1 quart water + 1/4 cup table salt. Boil for 2-4 hours and let the nuts soak in the water until cool. The less you boil the nuts the crunchier they will be. Most people seem to prefer them soft and creamy. I found this water salt ratio delicious but a little too salty for me. I boiled the first batch for 4 hours and did like the soft texture of the peanuts. For the second and third batch I added 2 teaspoons 5 spice powder and 1 tablespoon smoked paprika respectively, reduced the salt to 2 tablespoons and boiled for 2 hours. Add the peanuts, water, salt and seasonings (if using) to a stock pot. Bring the water to a rolling boil, cover and reduce to a gentle boil. Boil for 2-4 hours. 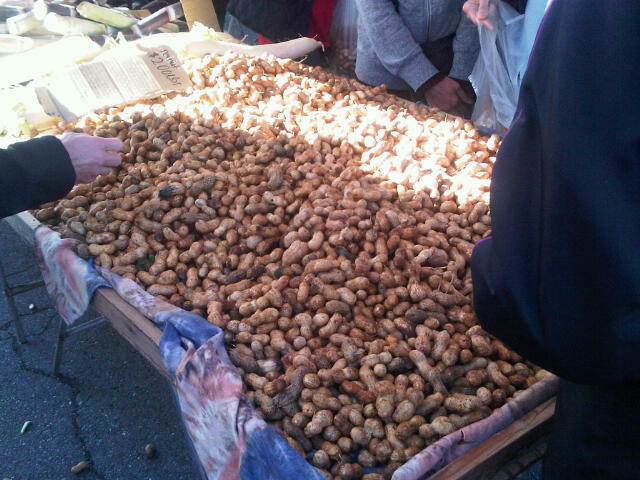 After boiling, let the peanuts soak in the water until cool. It was in the soaking phase I noticed the seasonings really penetrating the nuts. Strain and serve. The peanuts will keep in the refrigerator for a few days. Very nice, simple but hearty!